This wholesome and nutritious stew is a perfect way to start your Sunday morning. 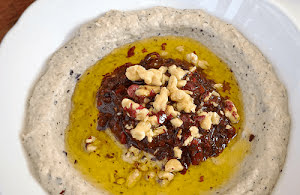 With chickpeas, one can make different types of unique and delicious preparations and this one is no different. You can either use chicken broth or can use vegetable broth for this stew. I prefer the latter option. I've just used carrots for the stew, but one can also add butternut squash, and sweet potatoes to it taking all three in equal proportions. 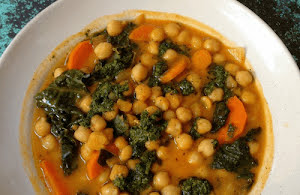 If you're not using canned chickpeas, soak them in water overnight and pressure cook for 10 minutes. The ground spices used in this stew can be adjusted according to your taste. If kale is not available, use spinach. Let's make this warning and fulfilling stew in a few easy steps. Smoked chicken soup has a distinct flavor and is a fulfilling option—anytime of the day. I've also added few chargrilled broccoli florets too to add some veggie goodness. Feel free to make it as rich and creamy as you want. You can make the same soup preparation with smoked lamb too. I've used white wine for this soup. You can substitute it with sherry too. 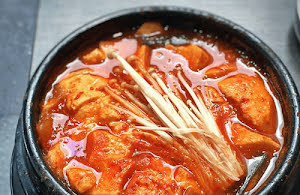 This soup is a bit spicy so make sure to moderate its heat as per your preferences. Do not add broccoli florets in pureed form else it'll alter the primary flavor. It can be relished with your favorite white bread or with corn chips too. Make it fresh and avoid refrigerating. 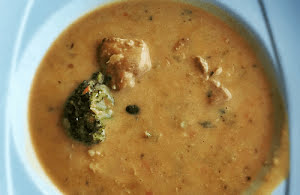 Let's quickly make this delicious and irresistible smoked chicken soup for our loved ones. 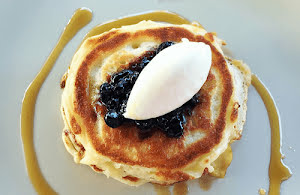 These buttermilk pancakes are one of my favorite breakfast options. They're so easy-to-make and can be improvised by adding the preferred toppings. If you're making these pancakes for the first time, you may not get the right texture—initially. But, with a bit of practice, you can get the right fluffy texture required for these pancakes. 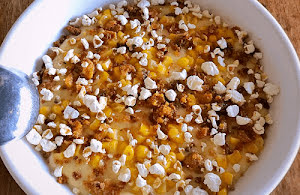 One can also add crushed fruits or candies to the batter to enrich and enhance the entire serving. Do not use refrigerated batter base for making these pancakes. Always prepare fresh to get the best results. I love to serve these pancakes with flavored milk. Let's make these light, fluffy, and delicious buttermilk pancakes for our loved ones. Do share your pancake versions too. If you prefer to eat healthy, seafood is definitely—one of the best options. The good thing about clams is that you can prepare them in a quick time. Today's clam preparation is easy-to-make and tastes so good. A strong flavor of garlic adds the required kick in this scrumptious clam recipe. 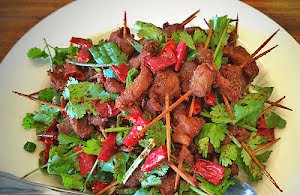 For a spicier version, use dried whole red chilies. Instead of searing in a pan or griddle, one can also cook these clams in an oven too. 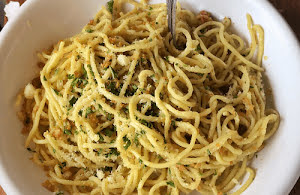 Feel free to drizzle generous quantity of extra virgin olive oil on top before serving. You can use the same process with your preferred variety of clams. Just make sure to adjust the cooking time as per the requirements. 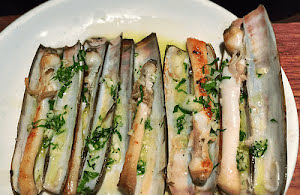 Let's make this delicious and healthy razor clam recipe. South-East Asia's rich and flavorful cuisine includes several delicious soups which are not only fulfilling but also taste—irresistible. 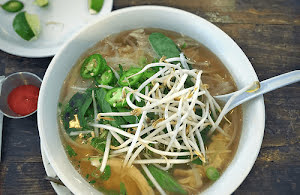 Today's Vietnamese soup includes both chicken and rice noodles combined with a flavorful broth. The authentic way to prepare this soup takes a bit time. I've used a shorter and easy method to get this soup preparation—done—in the minimum possible time. The garnishes or the toppings used for this soup can be experimented with though I'll recommend sticking with the suggested ones. The fresh serving of this soup taste best, so make sure you're not making extra servings of this one to keep in a refrigerated form for later consumption. Let's make this delicious chicken soup. Crab cakes are not only delicious but are easy-to-make too. You can use tender crab meat in different forms and this one is one of the best ways to relish it. Crab cakes taste best when served with a unique sauce. We've added a lip-smacking mint sauce preparation to complement these meaty delights. You're free to substitute it with your preferred sauce. I've used peanut oil to shallow fry these crab cakes but you're free to use your preferred vegetable oil. 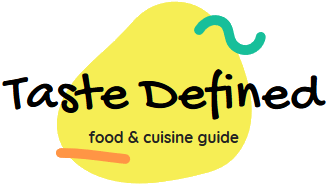 Added garnishes are completely optional and can be omitted. 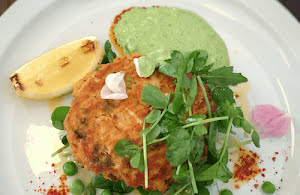 Fish cakes can also be made in a similar manner. I often stuff these mouth-watering crab cakes in my morning sandwiches. Let's make these scrumptious and fulfilling crab cakes—right now! Tostadas are perfect for a brunch or for a breakfast. They're quite easy-to-make and are totally delicious too. 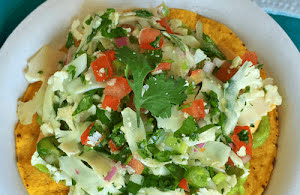 I've used a simple salsa for the tostada topping. Though I've made a base of avocado slices on the tostada you're free to directly include it in the salsa. I've avoided sriracha but if you want a bit spicy version, do drizzle it on top of the prepared tostadas. To get the best results, prepare these tostadas—right before serving. I've sliced cauliflower head's stem too, which can be omitted, if you do not like it. Feel free to drizzle generous amount of lime juice on top if you love sharp and extra-tangy flavor. So, here we go to make these tasty and crunchy cauliflower and avocado tostadas in a few simple steps. Croutons can be relished either as a tea time snack or can be included in soups and salads. They're quite easy-to-make and can be easily stored in an airtight container for a few days. The following croutons recipe is dead simple and tastes great in every form. Feel free to use your preferred bread but make sure you're keeping the flavoring agents—intact. If you're storing them, do microwave a bit before using in your favorite soups. 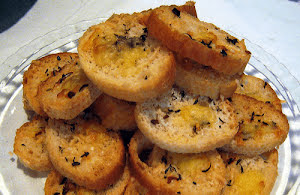 If you're using them as a snack, do not hesitate in adding more cheese to the croutons. I love to crush these croutons before adding to the soup bowl. Let's not wait further and learn to make these crunchy and delicious croutons in a few easy steps. Let's bake them, right now. Once you'll taste this popular Middle Eastern egg recipe, you'll make it again and again at the breakfast. You get simmering poached eggs on top of spiced up stew of tomatoes and peppers. Ideally, this recipe is made with a cast iron skillet. In case, you do not have one, use a regular thick-base skillet. For presentation, I've used a smaller skillet. While making this recipe, use a bigger one having enough space to add 5 to 6 eggs. Serve it piping hot with your favorite flatbread variety and with a bowl of fresh salad. Feel free to moderate the spices as per your preferences. Use ripe tomatoes to get the best results. 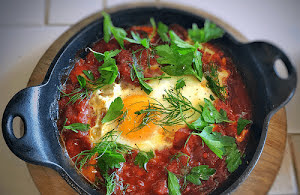 Let's make this spicy, scrumptious, and fulfilling Shakshuka recipe for our loved ones and friends. Once again, it's pizza time for my family members. We made a different one this time with a thick base and with a unique and cheesy topping. 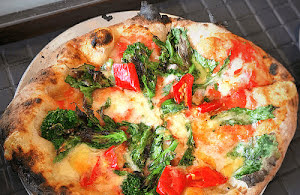 I've used fresh broccoli tendrils and Calabrian chili to add a different yet delicious flavor to the topping. If tendrils are not available, use roughly chopped broccoli florets. Similarly, if Calabrian chili is not available, use Anaheim chili and Serrano chili. Feel free to more veggies if you want to go for a more colorful and richer version of the same. If you don't like thick crust, go for the opposite making sure the topping is not that heavy. It a good way to make your kids eat broccoli which they generally try to avoid. Let's make this scrumptious broccoli and chili pizza.